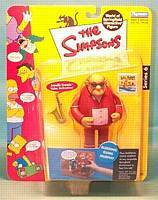 Description Of Item: EACH OF THE SIMPSONS FIGURES IS ARTICULATED AND THEY STAND APPROXIMATELY 5-inch TALL. THEY COME WITH EXCLUSIVE ACCESSORIES AND WHEN PLACED ON A COMPATIBLE WORLD OF SPRINGFIELD PLAYSET THEY SAY ONE OF SEVERAL RANDOM PHRASES. SOUNDS EXACTLY LIKE THE CHARACTER ON T.V. IT TRULY IS AN AMAZING TECHNOLOGY!! !